[prMac.com] Boston, Massachusetts - Langloria today is proud to announce the release of SAT Vocabulary Activator 1.0 for iOS devices. SAT Vocabulary Activator Application will help students to pass the SAT Vocabulary Exam with high scores. The application contains all of the 5000 SAT words and several options for working with each SAT Vocabulary word, helping you get the result you expect. Its ease of use and the ability to use it with friends will turn the process of learning of these words into a hobby. * A system for studying, containing 5000 words necessary for passing the SAT, with definitions, examples, sound files, pictures to help the memory, synonyms, links and a navigation system. * A system of testing made up of 3 types of testing and more than 5000 questions. * Internal games can be used to compete with friends and, if successful, get medals. * Openfeint Leaderboards and achievements. * It has a huge database of over 5000 words with clear definitions. 500 of the most common SAT words are recorded and can be listened to during the preparation for the exam from an audio file. The most difficult words have synonyms and are used in sample sentences. Several hundred of the most difficult words are provided with hook-words (new!). These come into your mind when you come into contact with the SAT words on the test, and help you to remember the meaning. For example: adamant - diamond, boisterous - boast, bursar - purse. Many words are illustrated by pictures, which help you to memorize the words which will take on a unique emotional coloring. * It has an automatic system of semantic navigation (new!) which presents the words and their definitions in an optimum order to create in your mind the semantic field of SAT words. It is much more efficient than other more laborious options of learning SAT words in alphabetical or random order. It is especially important if you are running short of time and cannot study the words in a traditional "read and learn way". You can move over the links, expanding your knowledge and deepening your understanding. * The application also has an indicator of how well you learn the words. It can give you an idea of how ready you are for the exam. There is testing in this program. Every word is included in our tests. Every word is included in our tests, so you can learn and then test yourself at the same time. Time is money and using this application can help you use your time better. * In doing the tests successfully you get points, medals (prizes) and you can compete with friends to see who is in the best condition. OpenFeint achievements and leaderboards are included to give you the chance to go head to head with other users and become the best in the world. Langloria Ltd produces educational, gaming and entertainment applications for mobile platforms and social networks. We will help you to learn a foreign language from the start in an easy way, to master a foreign language to proficiency level and to prepare for and pass foreign language tests. SAT Activator Full is $6.99 cents (USD). 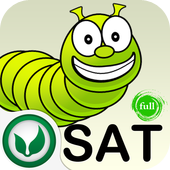 SAT Vocab Activator Ext is $0.99 cents (USD). SAT Activator Lite is free. All of this versions are available worldwide exclusively through the App Store in the Education and Game category. Located in Boston, Massachusetts, Langloria Ltd produces educational, gaming and entertainment applications for mobile platforms and social networks. The company has had many years of experience in developing applications together with prominent linguists and psychologists. For students and applicants to specialized colleges, Langloria plans to produce additional medical, legal and technical dictionaries which will be added to the extended version of their program. Copyright (C) 2011 Langloria Ltd. All Rights Reserved. Apple, the Apple logo, iPhone, iPod and iPad are registered trademarks of Apple Inc. in the U.S. and/or other countries.